The results of a recent survey by YouGov was published by SocialMediadd showing that 65% of mobile phone users prefer to receive promotional SMS offers sent to their phones. Only about 1 in 100 of our clients use SMS marketing, as opposed to 90% of them using email marketing. "Only about 1 in 100 of our clients use SMS marketing, as opposed to 90% of them using email marketing. This low penetration has led to cell phone owners only occasionally receiving offers via SMS text messaging. 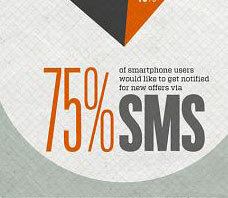 This is the primary reason for SMS being the most effective mobile marketing medium for eliciting consumer response."